HAVE YOU ALWAYS BEEN A SINGER? HOW DID YOU GET INVOLVED WITH SWEET ADELINES? WHEN DID YOU JOIN THE METRO NASHVILLE CHORUS? HOW DO YOU KEEP THINGS CIVIL? Sleep disorders specialist Beth Malow, MD, MS, discusses her off-the-clock passion for singing and competing in Sweet Adelines International and her involvement in Common Ground Nashville, a group dedicated to bridging gaps in a divided political time. In her professional life, Beth Malow, MD, MS, is the Burry Chair in Cognitive Childhood Development, professor of neurology and pediatrics, vice-chair for clinical research, and director of the sleep disorders division at Vanderbilt University Medical Center. Off the clock, she's all about harmony — both musically and in the political world. For more than ten years, Dr. Malow has sung with the Metro Nashville Chorus, one of two Nashville chapters of the Sweet Adelines International. She is also a facilitator of Common Ground Nashville, a group dedicated to bridging gaps in a divided political time. She spoke with Neurology Today about how she makes the two very different types of activities a priority when she's not working. Yes! I've probably sung since I could talk, and always really enjoyed performing. I sang in school groups and volunteered in nursing homes when I was in high school. I sang in the college choirs, and did school musicals too. I've sung some classical music, but my favorites have always been musicals and contemporary, popular music. I was newly married and working at the National Institutes of Health doing my fellowship training in epilepsy, EEG, and sleep. My husband and I went to an ice cream store in Bethesda and I saw a flyer on the wall that said, “Do you love to sing? Come join us!” While I was in medical school and residency, it had of course been very time-consuming, so I'd lost touch with the singing I had done my whole life. Now as a fellow, I felt I had a little more time. So I called the number and went to a rehearsal for a local Sweet Adelines chapter called the Heart of Maryland. I loved it! So I sang with them for the next three years. Then in 1994, we moved to Ann Arbor, MI, and my work life got a little busy and crazy. There was a Sweet Adelines group close to Detroit, but that was a bit of a drive for me, so I instead joined the Ann Arbor community choir for a few years while there. In 2003, we moved to Nashville so I could start the sleep program at Vanderbilt. I didn't join the group right away, but about five years after getting here, I decided I had to sing again. It actually happened after I went to see the movie Mamma Mia. I thought, “I have to do this again!” I realized I wasn't getting any younger, and if I was going to do it I needed to plunge in and not just keep saying I'm going to do it five years from now. I've been with the Metro Nashville Chorus for nearly ten years now. We're one of two chapters of Sweet Adelines in Nashville, because there's so much music here. We've competed internationally several times and are regarded as one of the top midsize choruses of the several hundred in the organization. We have a terrific director and we're in “Music City,” which really draws great singers! TELL US ABOUT THE GROUP AND HOW YOU PREPARE FOR PERFORMANCES. There are about 50 women in our group and we rehearse every Tuesday night. We not only sing, we do choreography and little skits. There are groups from many countries, including Canada, Australia, New Zealand, the UK, and the Netherlands as well as the US. I've been to Las Vegas and Baltimore for competitions, and October's is in St. Louis. There are certain song requirements for competitions. They love songs from the 40s and 50s, and they love show tunes, so we're doing “If Ever I Would Leave You” from Camelot, and “Oh! Look at Me Now,” which is from the 40s, for our semi-final package. In that portion we'll be competing with the winners from the 24 regions throughout the world. If we win that, we'll be in the top 10 and that's when we would do another package of four songs. I can't talk about that one since we want to keep it a surprise! It's nice because we can sing a variety of songs. There's something that challenges everyone. For me, it's the choreography! Doing dance moves while singing has never been a strength of mine, but I've gotten good at it. We watch and learn from videos, and then they videotape us and give us feedback. It's great to feel like you can pull that off, especially when your group wins despite your challenges with doing choreography. WHAT DO YOU FIND SO REWARDING ABOUT PERFORMING WITH THE GROUP? It takes you out of your shell. It's a lot more than just being in a choir. I sing in my synagogue choir and it's very different in Sweet Adelines, because you're competing. I like to say it's like a combination of being in a choir but also on a sports team. It's a bit like a sorority as well. It's a very giving organization. People are very supportive of each other. If a member is having a rough time with illness in herself or her family, everyone bands together to help and support her. HOW DOES DOING SWEET ADELINES WORK WITH YOUR PROFESSIONAL CAREER? My patients are also very interested in my performing. Several of them are songwriters or performers — after all, this is Nashville, so they're eager to see what we do. WHAT IS COMMON GROUND NASHVILLE, AND HOW DID YOU GET INVOLVED WITH THAT? Common Ground Nashville was formed shortly after the 2016 election based on the idea that people need to talk with each other and be able to discuss ideas related to politics in a way that promotes civil discourse and is positive. I joined because I've always believed that if you can bring people together who disagree you're going to wind up with stronger ideas. When the people who founded the group decided to pass the baton, another woman and I took over organizing it. There are about 30 people who meet every month to talk about everything from immigration to gun safety. An upcoming topic is affordable housing, a very localized issue that's not really Democratic or Republican but very important for our city of Nashville. Our group is very diverse in terms of race and ethnicity, and one person who comes is homeless. I pride myself on the fact that we have conservative, liberal, and progressive members. We get together, share ideas, and at the end of the evening we usually realize that we agree on more than we disagree on. I think it's important to discuss things face-to-face rather than on social media. We have ground rules. We start off each meeting going over them. The biggest ground rule is to be respectful of what the other person is saying even if you disagree. Try to be curious and understand someone's position even if it differs from your own. It's actually helped me become more tolerant in my work life. It's so easy to just express your own view without listening to those around you. A lot of us have also become more politically active as a result of being in this group. For example, we are working with our school board to make start times later. It's exciting to be co-leading something so positive that's making a difference in our city. “Off the Clock” is a new series featuring neurologists and neuroscientists who pursue a rich array of hobbies, interests, and passions outside of their work. Want to nominate someone for a feature? Send your suggestions (and why they are good candidates) to NeurologyToday@WoltersKluwer.com. 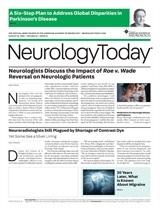 Neurology Today18(21):29-30, November 1, 2018. Does Vagotomy Reduce the Risk for Parkinson's Disease?